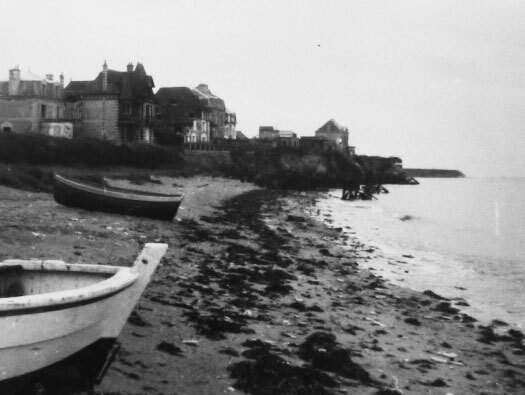 Wn21 Lion-sur-Mer (Trout), K.V.U.Gr Riva-Bella, K.V.Gr Caen. 'Trout' was the code name given by the allies to denote it as a strong point. 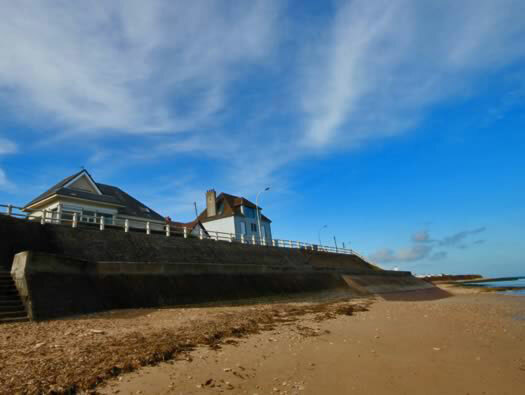 Wn21 a strong point in front of houses and perched on top of a 20' high cliff, had been damaged by fire from the sea but was still usable. 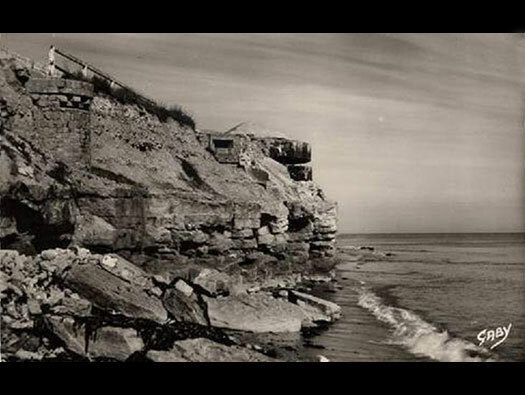 The machine gun post attached to the observation post and firing eastwards, had not been hit. The machine guns in this post and in the smaller open post, had fired many rounds. 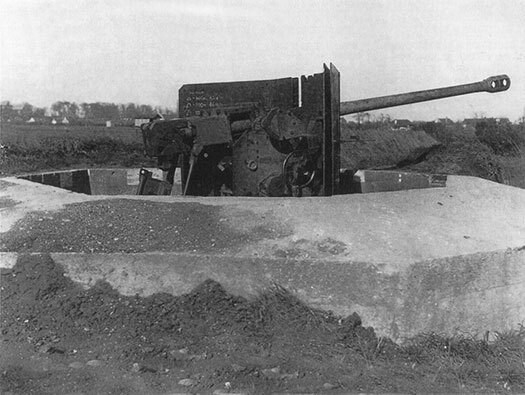 There was a 75mm gun [7.5cm F.K.231(f)] in an open position which may have fired. 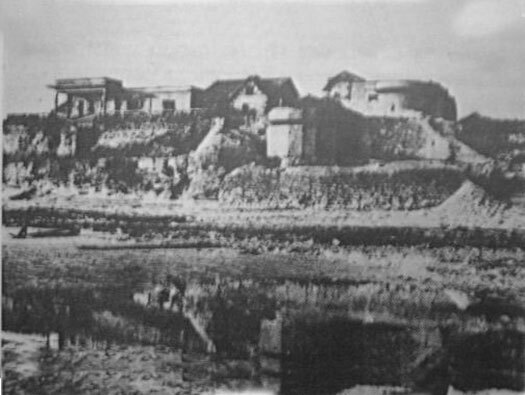 Houses in the area had strengthened basements and appear to be capable of strong defence; there were many interconnecting and firing trenches, both in front and rear of the houses. The houses had been shot badly from both sides but the strong points were undamaged. One machine gun had been hit from seaward but was still usable as a pit provided a new gun and crew were available [the trouble here was that here was no reserves]. The trenches were all in good condition. [DEFE 2/433] Report of Special Observer Party investigating the effect of fire support. Defended house with machine gun or sniper position under top window.. Layout of one of the observations. FluWa - a Luftwaffe forward aircraft spotting station in a wooden emplacement. 1 or 2 x 2cm Flak 30. 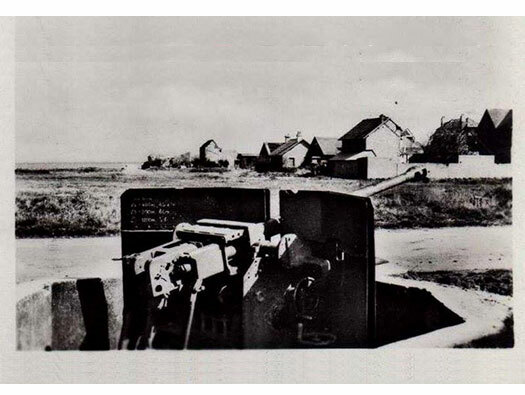 5cm KwK L/60 gun as it may have looked prior to D-Day. 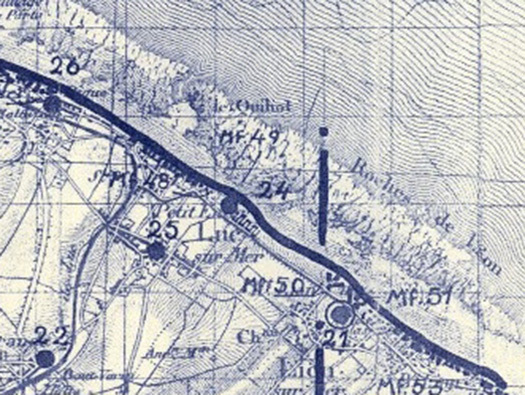 Wn21 showing its mine field Mf51 on the coast and Mf50 covering its western approaches. 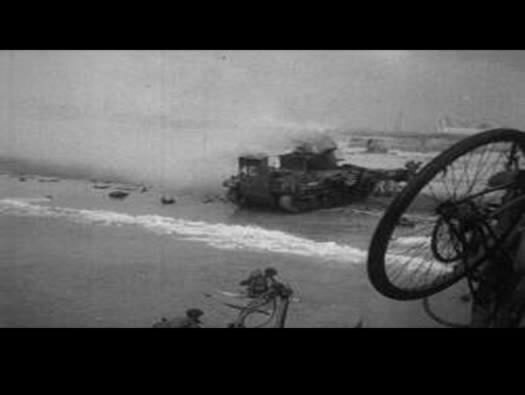 Laying Teller mines on a beach. The view towards Wn21 and the low cliffs beyond. Abandoned and boarded up houses. 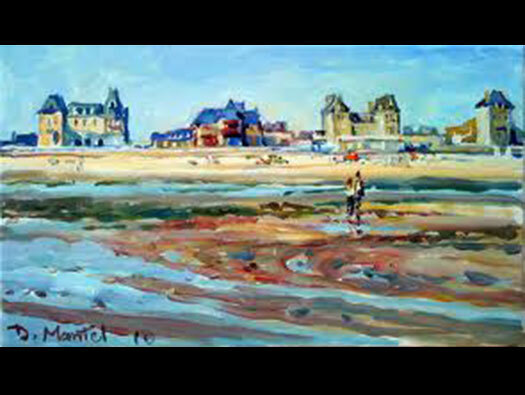 One of the beach exits to the east of the town. 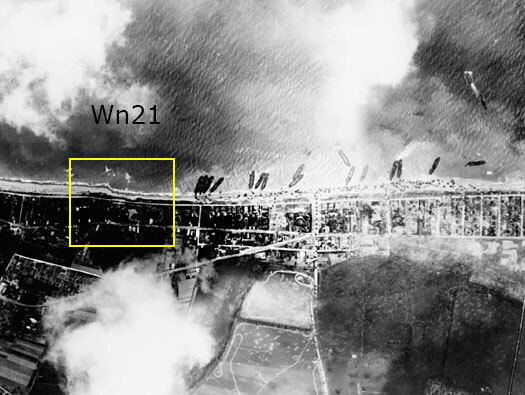 Wn21 around the 22nd June 1944. Mine crusher, a shell or mine is set in concrete and a long pole attached. A boat hits the pole which then comes into contact with the shell/mine and BOOM. Wn21 and the very distinctive house front and its still here but glass now fills in the canopy. 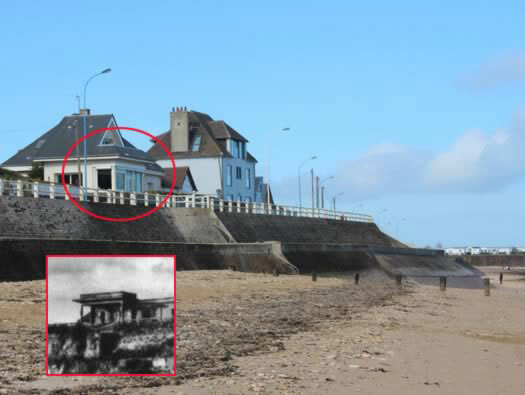 There are photos of Rommel on one of his tours of inspection outside this house. Wn21 in all its glory, the canopied house, two observations and an M.G. stand. Bombarded by the Allied Navy's at first light on the 6th June 1944. HMS Orion firing on D-Day. The view today with it all gone. Observation posts and M.G. stand. Observation posts and M.G. stand a better detailed picture. 8 foot machine gun pit. It also it may have been the FluWa a Luftwaffe forward aircraft spotting station. M.G.08 machine gun of the type that may have been used here. Where the observation bunker was situated. Observation posts and a near miss on the house behind it. A later photo of the one before as the hose has now been demolished. The several observations and M.G. stand. Radio and cable linked the observers t batteries inland. 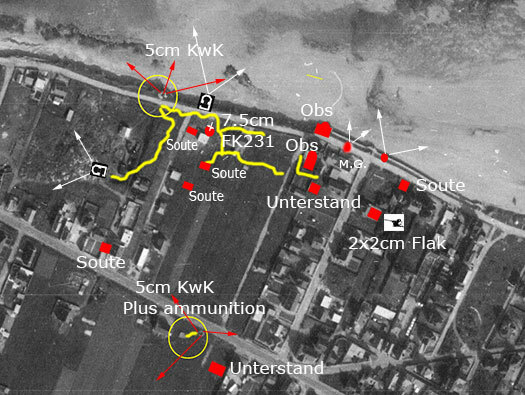 Horse drawn artillery of 10.0cm to 11.2cm were laid out behind the Wn. Looking back. Here was a 5cm KwK L/60 in an open ringstand. Continuing along the from where my last photo was taken and today there is a sailing club. But then, it was a way for fisherman to push their boats into the water. D-Day and for a few months it became a very important beach exit for anything landing in the area. Now we go inland one block and to the D514. There is now a camp site that straddles the road and in here was an Nr.1694 ringstand a 5cm KwK L/60 an ammunitions bunker and a an unterstand. 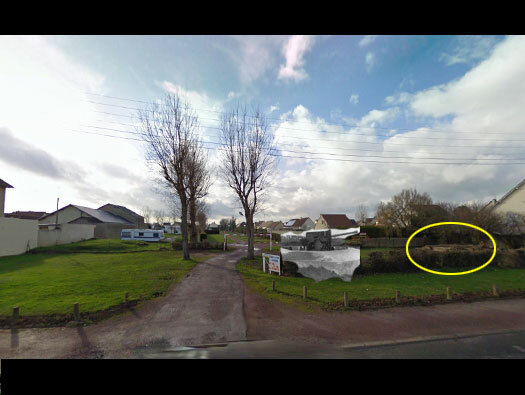 The camping site and roughly where the gun sat and circled the ammunition store. This is the 5cm gun here. 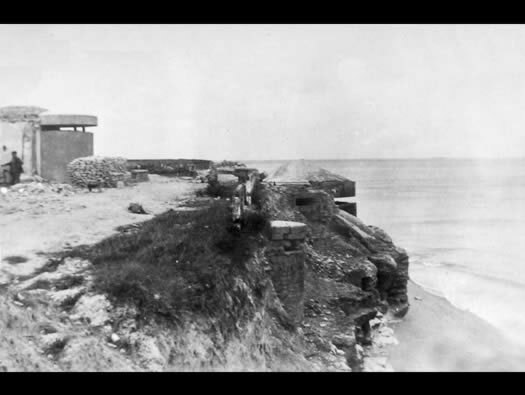 Inland a 5cm gun and a Tobruk machine gun and mortar positions had been constructed to guard the roads leading from the beach and running eastwards and westwards. 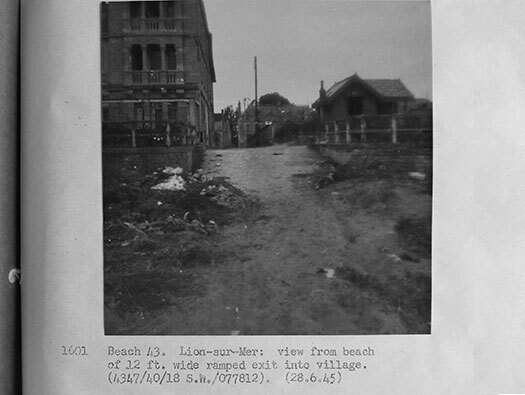 It was reported that the mortars and machine guns fired from this position were a considerable nuisance to those on 'Sword' beach for the first few days of the assault. 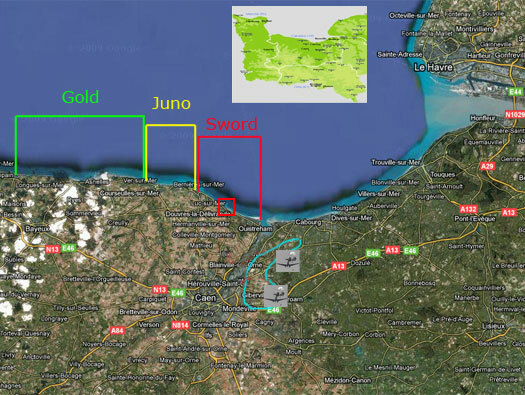 The positions were all taken by attack from the land side. [DEFE 2/433]. Behind the gun you can just see the trench. Another picture of the gun also showing on the rear of the shield are instructions printed. The D514 is running past the gun. There seems no damage at all to the gun position. 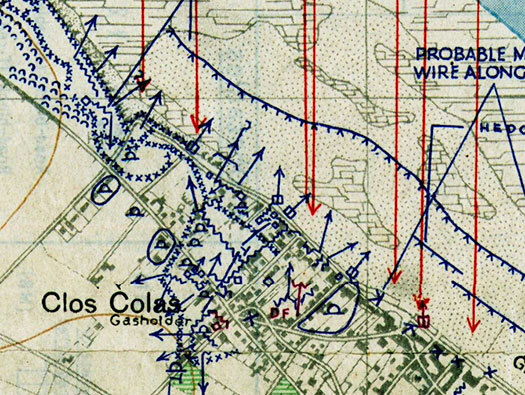 Prior to D-Day maps were produced to show what would be found when they were to attack. Landing Craft Infantry in Southampton docks awaiting the go ahead..
Convoy of Landing Craft Tank.